Good morning Bakersfield…It is Saturday, March 24th and a great day to be a Renegade. This past week Bakersfield was rejoicing in the rain that kept visiting us and revisiting almost every day of the week. What a blessing! So many highlights from this week…the brightest of them all was the recognition of Nan Gomez-Heitzeberg. The Cesar Chavez Legacy Breakfast is one place where community champions, who quietly work behind the scenes, are illuminated for their phenomenal dedication. Our own Nan is a part of this special group. This years other honorees included Dr. Horace Mitchell, California State University Bakersfield President, who was recognized with the Cesar E. Chavez Lifetime Achievement Award, and Esther Tarango Uranday whose key role in the United Farm Workers earned her the Cesar E. Chavez Si Se Puede Award (posthumously). The Kern Service and Conservation Corps (KSACC) and a group of EPIC High School students and ESL students were also highlighted with Si Se Puede Awards. It was wonderful to see many community leaders there supporting the event, such as Assemblyman Rudy Salas, Kern County Hispanic Chamber of Commerce President/CEO Jay Tamsi, and the office of Kern County Supervisor Leticia Perez. There was also a table full of BC leadership. Many walked away with a sense of empowerment and renewed vision for their own causes after hearing from keynote speaker Paul F. Chavez, the son of the late UFW labor leader Cesar Chavez. Paul Chavez shared personal father-son stories that tugged at the hearts of many in attendance. At one point, Paul reflected on advice his father shared with him, especially in moments of despair and struggle – in particular two that stay close to Paul’s heart: have faith in people; and persevere. His father always saw what others could become; he saw potential, and his vision helped others find their own path of success. I was moved to hear the story that Jose Gaspar (who was emceeing the event with Norma Gaspar) told about the passing of Cesar Chavez and how Corny Rodriguez addressed the KC Board of Supervisors to recognize the passing of a great leader. For Women’s History Month and in light of BC’s efforts to preserve and share our local history, Dr. Lydia Otero from the Mexican-American Studies program at the University of Arizona came to the Fireside Room on Thursday to share about the historical preservation projects she’s spearheaded in downtown Tuscon. After the success of “La Calle”, Otero partnered with the Borderlands Theater Company on an ambitious project called “Barrio Stories”. A camera crew recorded oral histories from Mexican-Americans in Tuscon talking about their personal lives, then those stories were re-interpreted as theatrical plays. The Borderlands Theater performed those plays during a four-day festival that utilized promenade-style staging, meaning that audiences could walk around the old town plaza and experience these stories happening at different stages in real time. You’re able to see all of the oral histories and performances on the Barrio Stories Project website, and a documentary about the project is currently in the works. Otero is currently working on a book tentatively titled “Quien lo Dice?” about Maria Cordova, a Tuscon woman whose house was seized by eminent domain and all evidence that she had ever lived there was taken out in a failed attempt to make the property a tourist attraction. Throughout her presentation, Otero emphasized the importance of valuing local history and bringing research out of the classroom and into the community. “Don’t forget the power of memory,” Otero said. This week, Juan Torres, Abel Guzman, Gustavo Enriquez and principal of Wasco Union High School, Kevin Tallon celebrated the Ribbon Cutting and Inaugaration of their beautiful brand new student services building. Inside, the building it’s filled with beautiful pieces of art that celebrate the rich history of Wasco High School. As your community college, BC is always seeking opportunities to improve communication and collaboration with our community partners. To this end, the Director of our Disabled Students Programs & Services (DSPS), Dr. Terri Goldstein, initiated the first meeting of what she is calling the “Kern Disability Collaborative.” The purpose of the meeting was to pull together those who work with people with disabilities in our community to learn who we are and what we each do. “Only good things can happen if we have a better understanding of all the resources available, as well as the unmet needs in our community,” said Dr. Goldstein. What started out with 20 invitations bloomed into approximately 50 attendees representing K-12 schools, higher education, non-profit organizations, and State agencies. “As the meeting date drew closer, individuals were calling and asking to participate in the meeting,” Dr. Goldstein said. The response just shows the need for this kind of group in Kern County. The idea for the Collaborative is modeled after the very successful “Kern Veterans Collaborative” which meets monthly at the National Guard Armory. After voting, the attendees decided that the Kern Disability Collaborative will continue to meet on a bi-monthly basis at Bakersfield College. The next meeting will be in May 2018, after college graduation, then the meetings will go dark for the summer, reconvene in August prior to the start of the fall 2018 semester, and meet every other month thereafter. In addition to discussing future meetings, establishing a listserv and web presence, everyone presented their organizational affiliation, populations served, and services provided. BC faculty member, Jaclyn Krause, announced establishing our Interpreter Training Program; which made everyone happy since there are never enough sign language interpreters to go around. Jimmie Soto, Executive Director of the Independent Living Center of Kern County, spoke about the need to support each other in our quests for additional funding— including partnerships, and letters of support. BC was well represented with DSPS, EOPS, Office of Student Life, Wellness Center, and Veterans Services. There were also representatives from Bakersfield City School District, Kern High School District, Kern County Superintendent of Schools, Taft College, Valley Achievement Center, Bakersfield GLAD office on Deafness, New Advances for People with Disabilities, Path Point, CA Department of Rehabilitation, Kern Vet Center, Kern Regional Center, and Autism Society Inc.
For more information about the Kern Disability Collaborative, please contact Dr. Terri Goldstein at terri.goldstein@bakersfieldcollege.edu, or call 661-395-4590. Everyone is welcome at these meetings! Bakersfield College is so enthusiastic about the incredible things coming to our community. Thank you Bakersfield and Kern County for supporting education and investing in BC through a Yes on Measure J! For all the photos, visit BC’s Smugmug. And thank you to Harold Pierce at the Bakersfield Californian for attending to share the exciting news with the community of Bakersfield. It was nice to see KCCD Trustee Kyle Carter, Trustee Romeo Agbalog, Mike Turnipseed and others attend this event. We received this email from Mikin Plummer about the event. The BC staff was fantastic!!! Thank you! Thank you! The gym was put together perfect and made set up very easy! Armando Trujillo, Student Veteran Educational Advisor and Lisa Robles Kent Program Manager, Office of Student Success & Equity were honored to represent Bakersfield College at a ceremony that provided full military honors for unaccompanied veterans interred at the National Cemetery who do not have family to recognize and remember them. Armando Trujillo, Bakersfield College; Randy Dickow, KC Veterans Collaborative; Maximo Perez, American Legion. It’s a privilege for BC to honor the great men and women who paid the greatest sacrifice for our country. While there, Armando and Lisa stopped to visit the graveside of Vernon P. Velenzula. I recall that he was spoken of so fondly by KCCD Trustee, Bill Thomas at our Veterans Resource Center unveiling. Vernon touched the lives of so many people here at BC and in our community. I only wish I had the privilege of meeting such an inspirational man. A Purple Heart recipient, Valenzuela’s desire to help veterans began early following his return from a tour in Vietnam in 1968. In the early 1970s Valenzuela served as president of the Associated Veterans Students club at Bakersfield College and later as a counselor supporting student veterans. Valenzuela worked for years as a professional therapist who focused primarily on aiding veterans with post-traumatic stress disorder and difficulties in making the transition between life in combat and life at home as a civilian. On Wednesday, students gathered in the Fireside Room to #SubvertStigma, the goal of Movies For Mental Health. “Stigma” was the hook, the tag line used by Leslie Poston, our facilitator, to open our awareness and provide perspective on the very complex personal, cultural and societal issues surrounding mental health and mental illness. The audience of 50 students, staff, faculty and community has steadily grown over the past four semesters since Student Health and Wellness Services began hosting Movies For Mental Health. And, so has the diversity of responses and perspectives on the question of what is “stigma.” Audience contributions included: “Shaming”, “barrier”, “judgmental”, “labeling”, “prejudiced”, “isolation” to name a few but ultimately, “stigma” is an erroneous and negative stereotype. This is where the movies come in. These are independent submissions, judged in competition; the films are poignant, evocative and selected by Art With Impact to stimulate discussion and reveal the unexpected, uncomfortable and inconvenient in the human condition. Following the movie screenings and the facilitated discussion, as well as a light meal of fresh seasonal fruit and wraps provided by Chef Eric Sabella, we listened to a panel discussion. The first panelist was a student named Caitlin who shared her very personal experience with profound depression and suicidal tendencies. Following Caitlin was our own Licensed Marriage and Family Therapist Rosealinda Carrillo, who shared her own path to strengthen her own personal mental health but also in becoming a professional counselor. Rosealinda exemplifies the adage “you can’t care for others if you can’t care for yourself.” Panelist and Professor of Psychology, Tim Burke lead us through the impact of suicide in his family, his reaction to a diagnosis and treatment for lymphoma and research-proven self-care modalities like meditation, yoga, mindfulness and of course exercise. The BC Student Health and Wellness Team was joined by guests from the Health Services program of Antelope Valley College, which will be hosting Movies For Mental Health on their own campus for the first time this May. Among those from Antelope Valley College were Dr. Jill Zimmerman Dean of Student Life & Services, Health Clerk Jennifer Winn and Monteigne Long, Veterans Program Coordinator. What is the value and importance of #SubvertStigma to students? As individuals and friends, cultures of origin and faiths, and society in general, we must free mental illness and mental health from stigma, shadow, and shame. This week was “Spring Fling” week at Bakersfield College with various events hosted by BCSGA as well as the Office of Student Life. Kicking off the fun was the “BCSGA Ice Cream and StudOrgs” event. BC’s clubs and organizations were joined by Ben & Jerry’s to promote various student organizations. On Monday afternoon, students were welcomed by BCSGA’s President Dezi Von Manos for her monthly “Cafecito Time” event where students can discuss issues or questions they may have in an open and inclusive way, and on Monday evening, BCSGA hosted an “Easel Event” where participants engaged in a fun evening of painting and light refreshments. Tuesday was the “Community Movie Day” where the movie Justice League was played for students to enjoy during lunch. On Wednesday we hosted the “Epic Proportions Tour” featuring the musical talents of Gabe Kubanda and People Who Could Fly. Wrapping up the wonderful events, students also had the opportunity to vote in elections for next years BCSGA leadership. Congratulations to next year’s BCSGA President, James Tompkins and Vice President, Ashley Harp. The Levan Center hosted a panel discussion on Wednesday providing legal and historical context to the ongoing debate about hate speech and freedom of speech on college campuses. Students filled out anonymous surveys before the panel asking them some basic facts about First Amendment law and their thoughts about various free speech issues. Levan Center Director Jack Hernandez then gave a brief introduction about some of the recent protests over white nationalist speakers appearing on college campuses before introducing the panel of BC faculty and administration. Communication professor John Giertz started with a brief overview of the Supreme Court decisions that have shaped free speech law in the United States. Colleges are bound by the First Amendment interpretation established in the 1969 case Brandenburg v. Ohio, which states that no inflammatory speech can be punished unless it incites “imminent lawless action.” In the 80s and 90s, many campuses attempted to enact speech codes and free speech zones, which have all been struck down as unconstitutional on the grounds that a listener’s right to be protected from hateful speech is not as important as someone else’s right to speak hatefully or however else they choose, Giertz said. left to right: Communication professor John Giertz, Director of Student Life Nicky Damania, History professor Erin Miller, and Levan Center Director Jack Hernandez host a panel discussion about free speech on college campuses on March 21st. Dr. Nicky Damania, BC’s Director of Student Life, gave students a practical description of the ways that he deals with free speech issues on the BC campus every day. At BC, Damania is in charge of enforcing academic freedom, which is the legal right of both students and faculty to teach or communicate controversial ideas or facts without fear of bias or punishment. BC history professor Erin Miller closed the panel with a discussion of the motivating history behind the United States’ free speech protections. Before the Revolutionary War, England used its common law to silence colonial dissent, which is why James Madison made free speech the first priority of the Bill of Rights to the US Constitution. Hateful speech is protected, Miller argues, because once a government agency begins to arbitrate which types of speech are considered acceptable, then speech that challenges authority can be silenced. On Thursday morning, BC hosted an intersegmental initiative on data exchange of student academic information. Right now we (high school districts, BC, CSUB) all have different data systems for maintaining student academic records and as these students in our community move from one segment to another, their academic records are transferred manually. This is unacceptable in the highly evolved tech world that we live in. The CSU systemwide Chancellor’s Office and the Community College statewide Chancellor’s Office have come together to solve this problem. BC is part of this pilot program that is fully funded by the Community College Chancellor’s Office and other private philanthropic groups. Here are some photos from the work session. See all the photos at BC’s SmugMug. The Education Futures Grant sponsored a Future Teachers Open House March 20th on the Panorama Campus. Close to 100 attendees braved the pouring rain to enjoy an informational and engaging evening with presentations, 10 breakout sessions, raffles, social media contest, and vendor booths. Presentations and vendors included BC Education Pathways, CSU Bakersfield, University of Lavern, Bakersfield College Career and Technical Education (CTE) & Student Employment Department, Bakersfield College Future Teachers Club, Brandman University, Child, Adolescent, and Family Studies (CAFS) at CSUB, Community Action Partnership of Kern (CAPK) Head Start, Community Connection for Child Care (CCCC), National University, Point Loma Nazarene University, and Western Governors University (WGU). A similar event was held at the BC Delano campus on March 3rd. A huge thank you to the Future Teachers Open House Planning Team, Education Futures Director, Kimberly Bligh, Anthony Cordova, Isabel Castaneda, and Erica Menchaca. CTE and Public Safety Pathway teamed up to host the first ever Public Safety Open House with 92 Kern High School District students in attendance. The event went full circle beginning with department faculty who provided an overview of the program outcomes and trainings available; student service representatives were available including staff from Financial Aid, CTE and Student Employment; finally, industry representatives from the City Fire Department, County Fire Department, EMS Department, Kern County Sheriff Department, Bakersfield Police Department and California Highway Patrol presented on a panel to share events and experiences in their professions. Students were given the opportunity to ask questions, participate in simulations and were even provided a tour of the different department vehicles. It was a great event that provided insight to the pathways available in Public Safety at Bakersfield College. Thank you to Brent Burton, Dominica Dominguez, BC Public Safety Faculty, Department Staff and the industry partners who worked so hard to put this event together. For all the photos, visit BC’s SmugMug. Closest to the screen on the left-Todd Coston (BC), beyond him-Hernando Mondragon (DO), beyond him-David Barnett (DO), moving to the right-Micelle Pena (BC), then Grace Commiso (BC), Somaly Boles (BC), Zach Quiroz (BC) and closest to camera on the right Dena Rhoades (DO). BC’s Grace Comisso, Michelle Pena, and consultant, Becky Weaver, presented on Using Starfish for Guided Pathways. And our Chief Technology Officer, Gary Moser, from the District Office presented on Are You Ready for a CCC Statewide ERP System. Finally, the participants had an option to rate each session via a conference app. As proof that the KCCD/BC team rock the house, check out this rating for Dave and Todd’s session. Todd tells me he isn’t quite sure how you can get 6 out of 5 stars, but he’ll take it anyway! KCCD and BC were present at a luncheon put on by the Kern Citizens for Sustainable Government with guest speaker, Lance Izumi, author of The ‘American Education Agenda’ Top 15 Recommendations for Improving Education. Lance discussed his newly published report, which offers policymakers concrete reforms they can adopt today to ensure every student learns in a safe and nurturing environment, and is well-prepared to meet the changing demands of the 21st century workforce. The League of Dreams, a nonprofit sports league for young athletes with physical and developmental disabilities, held its opening ceremonies for the 2018 season at CSUB’s Hardt Field on Sunday. Snagged this picture of Mayor Karen Goh with BC Renegades representing the College in their jerseys during the event. Odella Johnson was featured on KGET’s News at Sunrise program on Wednesday morning to talk about the STEAM Academy, a series of courses to promote science, technology, engineering, art and mathematics. Johnson spoke about the importance of the academy, which hosts a course every Saturday from September to April to help students build skills that they can use in their future careers. Open enrollment for next year’s academy, of which BC is a partner, is starting now. History professor Oliver Rosales wrote an article in the Community Voices section of the Bakersfield Californian on Sunday urging voters in the community to let their lawmakers know that funding for the humanities should be a top priority. Rosales, who chairs the committee on Energizing Humanities in the Central Valley committee, wrote about how proper funding of the National Endowment of the Humanities and California Humanities will allow those organizations to meet the demand for community enrichment projects in writing, history, philosophy, social studies and other subjects. “It’s important that we maintain a robust National Endowment for the Humanities, while at the same time mobilize voters to support state funding, as well as opportunities to increase public-private partnerships,” Rosales said. Official National Ag Day was marked on March 20th and I’ve enjoyed following BC’s wonderful Agricultural Business faculty, Chris McCraw on Twitter @CMcatBC as he shares our BC Ag Club at Kern County’s #farmdayinthecity! It’s so exciting to see our BC Ag Club students have the opportunity to share their agricultural knowledge with over 2,000 elementary students during this multi-day event! Kern County is the #1 Ag County in the U.S. and Ag Day is a special time to say THANK YOU to all our farmers and laborers, as well as our BC Agriculture students and faculty for educating and inspiring the next generation of agriculturists! So fortunate to have a real vibrant Ag faculty and staff. On Thursday, Cal State Bakersfield announced that Lynette Zelezny will be the new president to succeed Horace Mitchell at the end of the academic year. The announcement was featured in a front-page Q and A article in the Bakersfield Californian written by Harold Pierce, as well as an article by Chloe Carlson for KGET. Zelezny is CSUB’s first female president, and she’ll be transitioning from her role as the provost and vice president of academic affairs at Fresno State to come to Bakersfield. 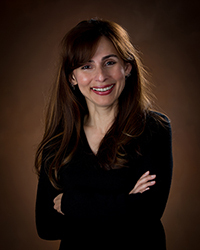 Zelezny has bachelor’s and master’s degrees in psychology from Humboldt State University, a Ph.D. in applied social psychology from Claremont Graduate University, and an MBA with distinction from Fresno State. This week we had the Grater Bakersfield Chamber Board meeting. I am honored to be on the Board of this wonderful organization — great board members, great CEO and great staff. I was delighted to see leaders from the City of Bakersfield visit us to discuss some critical needs including the need for more police officers. The team who presented included City Manger Alan Tandy, Councilman Andrae Gonzales, Concilman Bob Smith, BPD Chief Lyle Martin, Assistant City Manager Chris Huot. Liz Rozell and Cindy Collier are two amazing people who continue to inspire us all. I loved this photo because we all need to just lean on each other sometimes. Thank you Cindy and Liz for your dedication to BC and the Kern Community College District. ← BC is Booming with Activities!